Air Combat is noteworthy not only as a launch title (it was actually released 4 days after the system officially launched), but also as the first installment of the acclaimed “Ace Combat” series. The basic premise of the game is that you are part of a group of mercenary pilots who are hired by a fictitious country (“Kaluga”) to quell a well-funded and well-armed terrorist uprising. You are paid per mission and per enemy shot down. The money you are paid is then used to buy better planes and hire wing men to assist you when the need arises. Available planes include the F/A-18 Hornet, F-117 Nighthawk, and the Soviet MIG-31. Do yourself a favor before you even start the game, and switch the control scheme from the default “novice” mode to “expert”. This gives you independent control over roll and yaw. Due to the game’s age it is not compatible with the analog controller and therefore must be played using the digital buttons only. While the controls aren’t sluggish, it does feel awkward having to play the game with a digital pad as it is not possible to control your rate of pitch, roll, or yaw. You’re either moving or you aren’t. The missions do their best to be varied, but it always comes down to blowing up as much stuff as possible without getting hit; the only real variable being the priority of the targets. The game features a 2-player head-to-head mode, but it feels like an afterthought. Link-cable support and a few different environments might have made the 2-player mode better, but a game like this is really meant for the single-player experience so it doesn’t much matter. For a launch title Air Combat’s graphics are good with a decent amount of detail. 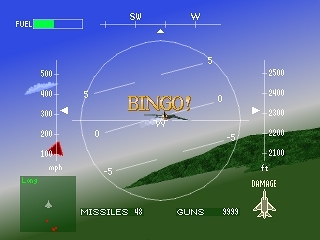 The game is too arcade-like to be called a flight sim (and in fact was based on Namco’s 1992 coin-op “Ace Combat”), but it never claims to be. I hadn’t played the original game before logging a lot of hours on the sequels, but Air Combat really didn’t feel like much of a step backwards. The biggest complaint I could make is the lack of analog controller support but since the game was released two years before the analog controller, it really isn’t a fair criticism. It does however call attention to the game’s age. The game is also on the short side, with only 17 missions. I wasn’t fortunate enough to buy a Playstation on launch day, but if I had it would have been a tough call between this game and Ridge Racer. Buy Air Combat on GameGavel or Amazon. Tagged 1995, Ace Combat, Air Combat, Flying, Namco, Playstation, PSX, Review, Simuation, Sony. Bookmark the permalink.